Lo Romero Golf is located in the province of Alicante, Spain, at Km. 29 of the road from Pilar de la Horadada to Orihuela. Pilar de la Horadada is close to the Mar Menor Sea and the Mediterranean Sea. Lo Romero Golf is easily accesible from the motorway, take exits 770 or 774 of the AP-7, which links it from Cartagena and Alicante. The local airports of San Javier, 20 minutes from Lo Romero and Alicante Airport 45 minutes serve the area. According to Club Murcia, Lo Romero is "set in a beautiful landscape, surrounded by orange and lemon tree plantations", making it the perfect spot to hone your skills during a break in Spain. 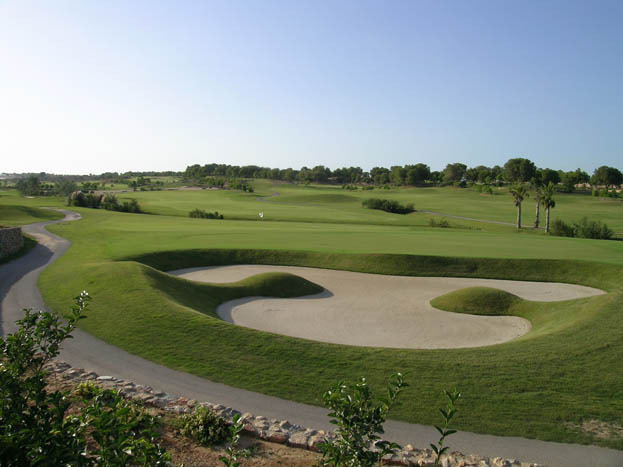 The course has been designed by Jorge Gallen and Enric Soler (2008) in harmony with the landscape and is complimented by Mediterranean vegetation, as well as impressive lakes and bunkers. Players are sure to be impressed by the 18th hole on the course, which is in fact a small island surrounded by water. The golf course and greens are kept in the finest condition throughout the year to ensure a perfect golf experience found. The glorious Murcia climate also provides players with a mild climate that provides golfing weather all year long. According to the resort's official website, "the fear to strike the ball too hard or too gentle and the ball landing in the water makes your hand go unsteady, your heart beat very fast, your adrenaline raise and your senses sharpen". In addition, Lo Romero is home to an impressive range of practice facilities, including chipping greens and a driving range. There is also a clubhouse, where players will find changing and shower areas, as well enjoying a bite to eat and a refreshing post-game drink. Equipment can be hired from here and guests can head to the golf pro shop to stock up on clothing, balls and tees. To begin this fabulous golf course at Lo Romero is a par 4 hole over 320 metres. As you tee off from the elevated area you will oversee the narrowing fairway featuring out of bounds areas down the left hand side whilst to the right you will discover water hazards adjacent to the fairway. Sloping gently left to right, the fairway plays a big part in producing a tricky opening hole. Those golfers who are comfortable with taking a driver off the tee will be able to carry the ball to roughly 50metres short of the green. Players who are not as confident are able to find the fairway with a different choice of clubs. The protected green is not large and is surrounded by water running around to the back from the right hand side. Protecting the front left of the green; you will find a bunker capturing the less accurate shots. Hole 2 consists of a slight elevated tee off area as golfers play over 484metres at par 5. The hole incorporates a dog leg right with more than one line of attack to the green. Players who find themselves comfortable with the longer drive are able to reach the green in 2; whereas the safer option is to reach the corner of the dog leg in 2. This will leave players with a more or less straight forward approach to the green. Water and out of bounds hazards surround the fairway and green to produce a challenging green to any golfer. This second longest par 4 of the Lo Romero golf course provides a challenge as securing par requires a good solid drive throughout. Players have generous amounts of room to surpass the out of bounds areas on the fairway to arrive safely at the green. Golfers should not suffer any great deal of difficulty on the green even for inaccurate shots. With the only bunkers to the left hand side, achieving par could be a possibility for the more experienced. Players have yet another chance to play over a dog leg, but this time to the left. After the three previously difficult holes golfers will find this hole a little more comfortable. Clearing the trees to the left of the tee, players should find little difficulty finding the fairway from the corner to provide a straight approach to the green ahead. This hole has an unguarded elevated green that is open for the aggressive and confident players to go for par. Inviting you onto the hole is the wide open approach from the tee off area. Hole 5 consists of 158 metres of bunkers shrubs and trees along the way to the green, so expect some difficulty as you play. The front of the green is surrounded by a series of bunkers with shrubs and trees at the rear to capture the off target shots. Golfers are expected to make a two putt par once on the wide green to be successful on this hole. With a slight dog leg left, this par 5 is the second longest and also easiest of the course. Players will not find it a breeze however, the tee has been made to be challenging for all types of golfer with a sloping fairway towards the water hazard after tee off. Down the left hand side provides a great ideal opportunity for golfers to take an aggressive line. The longer hitters will be able to reach the green with a good chance in two shots from a solid second drive by taking advantage of the uphill slope. The opportunity of a birdie can be found on this great par 5. Hole 7 is the longest of the par 3 holes at Lo Romero at 180 metres. Golfers will find this a straight hole with little obstructions or hazards along the way. Generous amounts of space are found at the enormous green, forgiving the less skilled players. The green side bunker to the right is worth taking consideration of depending on the pin position. A less liked downhill putt will occur with a front pin from the centre of the green. The fairway begins to the right of the tee off area at hole 8 as golfers tackle the 361 metres at par 4. This is one of the most challenging par 4’s of the Lo Romero golf course that requires accuracy and a good drive due to the large bunkers situated at the landing area on the fairway, amongst a water hazard to the right hand side. From the tee golfers will have to carry at least 150metres to reach the fairway for any chance of matching par. The difficult approach requires a good drive onto the green without going too long as water lays at the rear of the green. This is a tough hole for most golfers providing challenging aspects throughout. This is the final hole of the front 9 at Lo Romero, featuring par 4 over 320 metres. To reach this hole, players are required to walk around the back of the 17th hole, giving you a glimpse of what lays ahead. Players should be able to achieve par at this short hole by mixing confident drives with strategy to surpass the hazards found. Fairway bunkers are found throughout to the left and to the right you will find the same but with added water hazards. Plenty of room is found upon the fairway to give players a good chance to reach the green. At a slight uphill glance, this par 5 is a long 506 metres where out of bounds and a series of bunkers come into play. From the tee off area, players are recommended to avoid the added difficulty found and to proceed to drive down the left hand side of the fairway, avoiding the out of bounds area spanning across the entire right side. A series of bunkers are also found down the right side of the fairway to add further difficulty. Golfers should use the full width of the fairway to achieve an ideal position for your second shot. It is worth noting that the uphill approach to the green is uphill, adding further complexity to the hole. Golfers who play this hole well will be able to match par. Playing over 292 metres golfers will certainly enjoy this par 4 hole as views to the green through the pine trees are seen from the tee off area. As the fairway is bordered by the pine trees, lost balls can become likely if off target. Players are required to carry the golf ball over 150 metres to reach the fairway from the tee off area to make things a little more challenging. Anything short will result in a more difficult approach as they find themselves stuck in a deep hollow. The ideal line to realistically reach the green with the least amount of trouble is to drive straight from the tee. This hole is suggested to be the most difficult par 3 over 175 metres from the yellow tee. The distance to the green can look misleading from the tee off area but is recommended that players should take advice from the scorecard issued to you prior to your start at Lo Romero. With generous amounts of room found on the fairway and green. The green itself is relatively level for a less demanding end to this hole. Water is found to the left but does not seem to become a hazard to the golfer due to the vast amount of room found to the right and behind the green. In order for any golfer to be able to play this par 4 hole at 316 metres is to reach the top tier of the elevated fairway from tee off or great difficulty will be found. With two large bunkers on the fairway, players must be careful not to find themselves straying into these or even rolling backwards down the fairway slope. To safely access the putting surface of the green, players will be required to clear the large gully situated in front of the green. To successfully clear the pine trees that surround the green, players will need to loft the ball. This is an excellent par 4 testing players ability throughout. Found at hole 14 is a less enduring dog leg right, at 319 metres this par 3 will regain the players confidence after the previous hole. As you begin the hole, it is recommended to tee off from the right of the box to provide you with the best line and resulting position. The featured dog leg is best played to the left hand side of the fairway, there is a fairway bunker to overcome but with a kind amount of space a good drive will put them ahead of those who take the right side path. With a bunker and trees found to the right, players trying to cut the corner may come across trouble. The uphill approach should cause little difficulty to reach the green in two where you will discover a bunker placed in front. Players will enjoy this challenging par 3 hole of the Lo Romero golf course. At 170 metres golfers will be put through their paces when it comes to difficulty from the hazards found between the tee and green. The tiered green will cause great difficulty to those who are playing for par or under due to the huge borrows and any shots to the left or right will encounter trouble. To test most golf players, this hole is regarded as difficult over a long 409 metre par 4. From tee off bunkers are found to the right hand side so a good drive is essential for a good chance on par. A word of warning for those who try to take a big drive down the length of the fairway as straying of inaccurate shots will lead to encountering trouble. There are a sufficient amount of trees down the right side of the fairway to cause an issue, whilst on the left hand side a gully if found. A central position will lead you to a great approach onto the green. Water soon comes into play by running down the left hand side of the green with a daunting large bunker to the right. the penultimate hole of Lo Romero golf course is a long par 5 at 473 metres long featuring a dog leg left. A solid drive is essential on this hole to achieve a good result. It is advised to strike a powerful but accurate drive down the left hand side of the fairway due to the sloping contours on the left side can carry you into the two large fairway bunkers. Those who are trying to reach the green in two will have to stay alert from all types of hazards including the water to the right side of the fairway. By taking the best approach from the left you will be able to access the tiered green a little easier but is still regarded as difficult. This is the final hole of Lo Romero golf course, playing from the yellow tees it reaches 356 metres. Players have a final chance to achieve par as the tee position is elevated to provide golfers with a view of the course, including the island green in the distance. A good drive is favourable to accompany the down hill slope. A short approach to the green is beneficial instead of playing too long. With a handful of bunkers on the right side of the fairway, players avoiding will have a good chance to reach par. With a danger of water this finishing hole is difficult to complete to provide players with a great hole to finish with. Golf lessons start from 15€ with Lo Romero Pro Alex Ward.